What is a Property Tax Exemption? Property tax exemptions in Texas lower your taxes by removing part of the assessed value of your home and/or placing a cap on the amount of taxes you pay. 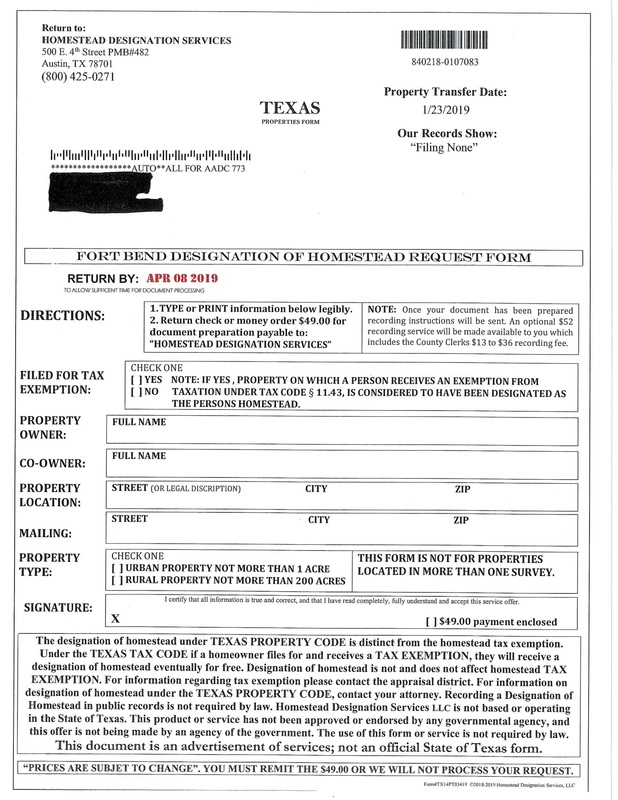 All homeowners can claim a Homestead Exemption on their primary residence in Texas. Applications are accepted by the tax appraisal district in the county where the property is located. In order to receive the exemption for the current tax year you must have owned your home on January 1st. You only need to file one time. The exemptions remain unless reapplication is requested by the taxing authority, or you notify them that the property no longer qualifies. Applications must be filed between January 1st and April 30. There is no cost to file for tax exemptions. Do not be fooled by scammers who send official-looking letters that request money to “Certify” your property as being tax exempt. 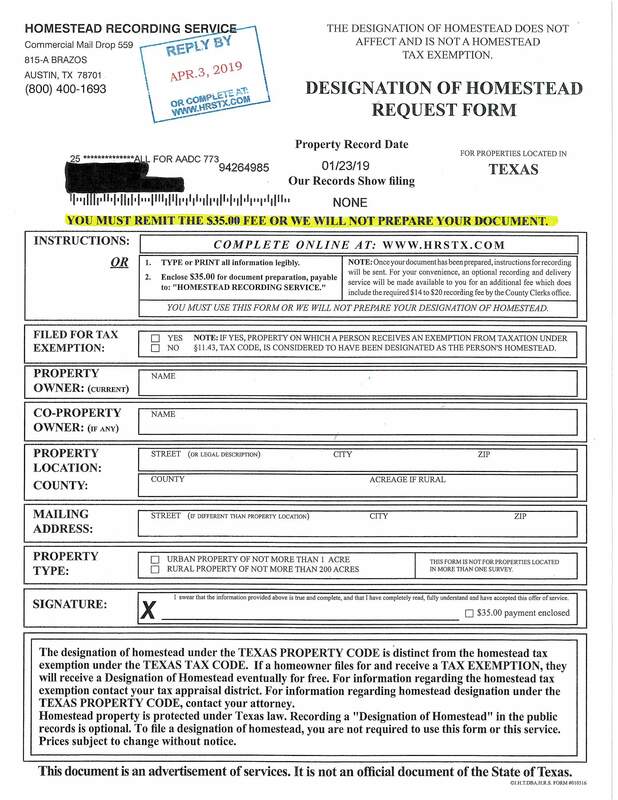 Any homeowner in Texas (not a business) can apply for this exemption for their primary residence. It cannot be applied to investment property or second homes. To apply, you must fill out Application Form 15-114 and present a currently valid driver's license or TX State ID, with the address matching the property you are applying for the exemption. You may qualify for this exemption if you receive benefits under the Federal Old-Age, Survivors, and Disability Insurance program. You cannot receive an over 65 Tax Exemption if you are receiving a Disability Exemption. This exemption can be added to your primary residence when you turn 65. It can also be extended to a spouse over 55 upon the death of the applicant. You may qualify if you are a veteran who is classified as disabled by the VA or your service branch. A surviving spouse who is not remarried and a dependent child may qualify for this exemption. A client of ours who bought a house last year received this very official-looking document in the mail. He asked me about it, not sure what it was for. It looks like a very important document from the state, or so it seems. It is a SCAM, a way to collect money under false pretense. There is no charge to file for a Homestead Tax exemption. And all primary residences in Texas are covered by state Homestead Protection laws. Homestead laws protect homeowners from losing their primary residences in bankruptcy or from lawsuits. You do not have to file any documents to have this kind of asset protected under the law.